I have made these cookies for several years. They are from Allrecipes.com. 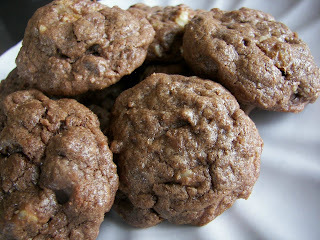 I really do love these cookies...a chocolate base with chocolate chips and nuts. It is like a brownie cookie. They are simple to make and are great to pack in cookie jars or school lunches. In a medium bowl, cream sugars with butter until smooth. Beat in the eggs, one at a time and add vanilla. Add baking powder, salt, and cocoa powder. Next add flour, one cup at a time, beat in well. Stir in chocolate chips and nuts. Roll tablespoons of dough into rounds and bake at 375 degree (I used 350) oven for 8 to 10 minutes. Do not overbake! Cool on wire rack for 2 minutes. When I made this recipe today, it made about 42, small-sized, cookies. 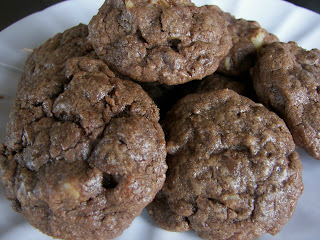 What could be better than a brownie cookie??! These look so delicious! Can I have a couple?? I am so glad I found you. You have many wonderfully delicious looking recipes. I will be checking back often! Following you! Have a great weekend. Sweetie I hope you don't mind I had a couple of cookies while I was browsing tonight. Yummy. OMG these are better than Lay's chips, "Betcha can't eat just one?" Oh thank you for stopping by and for offering to send Colette a card. I so want to stuff her box with love. I promise to give updates periodically to let folks know how she is doing. Your cookies look lovely! Nothing beats chocolate and chocolate chocolate chip -- does it get any better than that?